Like many parts of the body, hair also needs a special care, specifically if you have damaged hair. However sometime give your hair a special treatment. Believe it or not it’s quite tricky and if you are failed to give a regular care, can be abused, also can make your hair dull or lifeless. 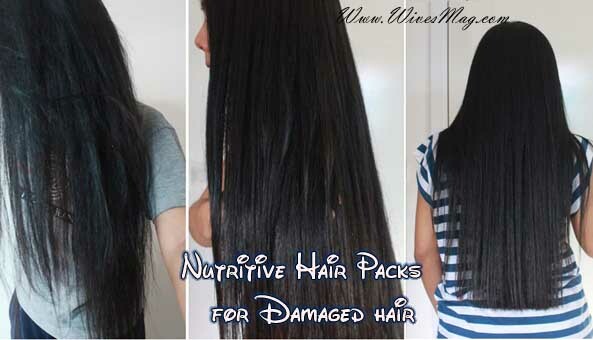 The following nourishing hair packs will give your damaged hair that much needed vitality. Peel the potatoes and mash to a paste in a bowl, mix mashed potatoes, egg yolk and honey. Apply on dry hair and let the mixture stand for 30 minutes, rinse and wash as you normally do. You will get beautiful hair with some volume. Hair naturally requires some care to stay healthy, remember that not everything depends on treatments, nutrition is vital for maintaining beautiful hair. If you still care for your hair and love to look for new ways more natural than that commonly are used, you need to check the following mentioned mask to revitalize hair that I have prepared for you. In a bowl add the ingredients and blend until smooth mixture, apply on dry hair and leave on for 30 minutes, rinse and wash as usual. A mask that you can make at home to help your damaged hair and to regain its shine, softness and also it helps the growth of the hair. Mash the pulp of banana and mix well with oil, apply on your scalp to reach the roots thereof, with a gentle massage; let stand for 15 minutes, wash and get dried normally. You will feel like brushing your hair immediately to regain its vitality. You can do this treatment three times a week. Here I suggest this mask to get silky & straight hair easily and cheaply, for many years. It is very simple mask, only requires that you have to add in your regular shampoo the red grapes juice and rose water, perfectly stirred and used as usual, you will notice how quickly your hair looks silky and shiny, it is important to be consistent and whilst you brush your hair with your natural bristle brush, will feel a clear difference; you can try to braid it when you’re home and don’t mistreat with hair else they will get split ends; however trim them at least once a month.